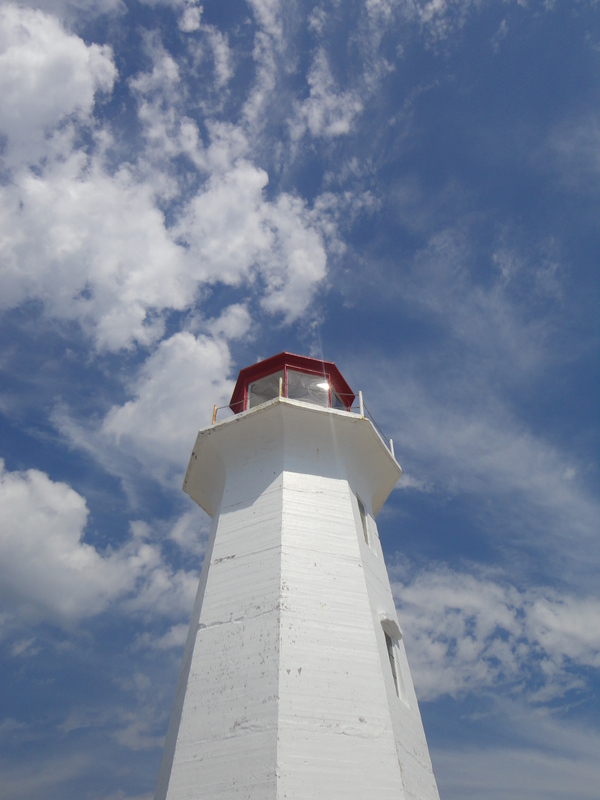 Peggy’s Point Lighthouse sits high on smooth wave-worn granite, nestled in the fishing village of Peggy’s Cove. Located on the eastern shore of Margaret’s Bay, I traveled to the lighthouse with Janette Farnell Wallace, our Nova Scotia Tourism Guide along with three other travel writers. It is easy to see why this is one of the most photographed places in Nova Scotia and why visitors flock here to be lulled by the Atlantic waves hitting against the stone. When I was there, one woman laid back against the rock and read, others just sat looking out to sea, day dreaming and recalling what once was. The geology of this area is amazing. The smooth granite rocks were formed by the migration of glaciers and the ocean tides when 20,000 years ago when an ice ridge moved south from Canada Arctic region is covering much of North America. Large boulders composed of 415-million-year-old Devonian granite, called glacial erratics were carried for long distances before being deposited upon the landscape. I was fascinated by the large boulders along the shoreline and even in the lovely Mercy River that we canoed in later in the week. 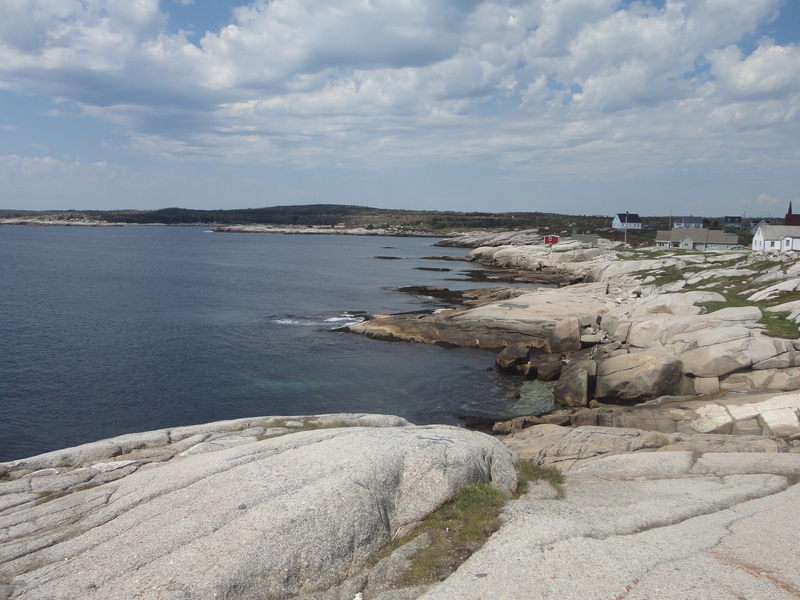 Because of the unique landscape, Peggy’s Cove has been declared a preservation area. The story of the cove is a legend. Our group was titled “Lighthouses and Legends” so this fit right into our story line. The legend behind Peggy’s Cove is in the name. They say that the cove was named after the only survivor of a schooner that ran aground and sank in 1800 at Halibut Rock. On the website, they state that the survivor was named Margaret. “Local folk called her “Peggy” and her home came to be known as Peggy’s Cove. Other stories suggest the village was named after the wife of an early settler, although the most popular legend claims is that of the sole survivor of a shipwreck. There is dissent over the survivor, some say she was a little girl too young to remember her name and the family who adopted her called her Peggy. Others say she was a young woman that married a resident of the cove in 1800 and became known as “Peggy of the Cove”. The Sou’Wester Restaurant and Gift Shop started as a small five table tearoom at the side of a house at its present location. The restaurant and shop has expanded over the years. We didn’t eat there, but it was a fun place to stop in. The diner offers 180 seats with traditional maritime & seafood meals. The Sou’Wester is still run by the family of its founder, Jack Campbell. 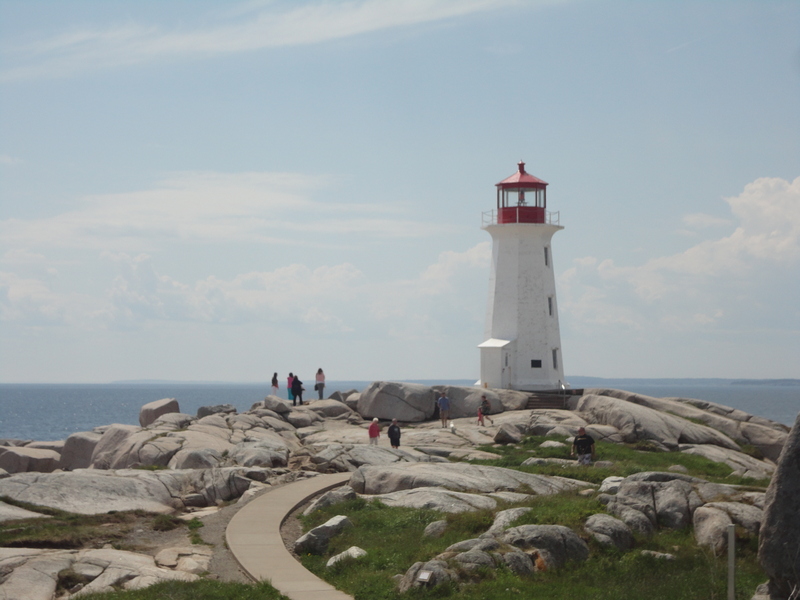 The current lighthouse at Peggy’s Cove is called Peggy’s Point Lighthouse and was built in 1915. The lighthouse also served as a working post office. Log onto the website. http://www.peggys-cove.com/company_information.shtml for details! Next Post: Acadian Maple Syrup opens their store to tourists wanting to learn more. it has then become a category 2 hurricane, something unbelievable to be around. off my chest, so to speak.